Devin popped the question last night! 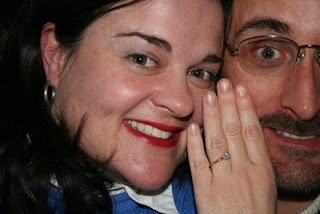 We had already talked about getting married, of course, but I hadn't expected a ring, much less a proposal, at this point. He is such a romantical person. He actually wrote his proposal out, so I get to keep it forever and ever. 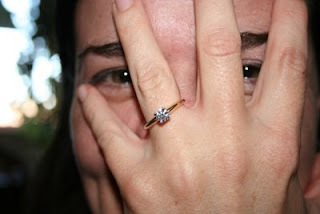 I feel like a moron because I keep staring at my ring finger in disbelief. It's been a long time since I wore a ring on that finger and it still seems strange. We aren't sure when the actual ceremony will take place, but rest assured you will be the first to know (well, after my Mom and Dad, and Diane and Lizard and Mel and Cheri...but you know what I mean! !